What started as a hobby has now become a passion! 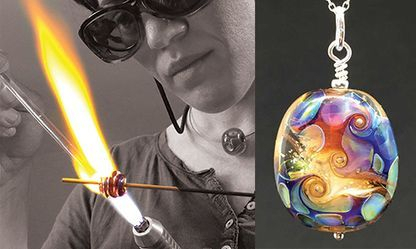 Liz has been melting glass since 2012 and now creates intricate and unique lampwork designs which are then turned into one-off pieces of glass and silver jewellery or small glass ornaments. Each bead is carefully crafted by melting multiple layers of glass together in a flame before being slowly cooled in a kiln to add strength and prevent thermal cracking. Liz only uses gravity and simple tools to shape her beads, therefore each piece is guaranteed to be unique.